You go somewhere special or spend special time with someone you love, then later regretted that you hadn’t really taken the time to savor it? Hadn’t taken the time to just let the moment penetrate the recesses of your memory? Or allowed yourself to think, “This is so special, I need to always remember exactly what I’m thinking and feeling and doing”? Life tears by and we often fail to mark the special times in memory and reflection. The word translated as treasured is, in the Greek in which Luke wrote his gospel, a compound word that means gathered together. Mary gathered together the events of that night and pondered or, in Luke’s original words, threw them together. In other words, Mary made a point of noting and remembering everything that happened on the first Christmas. Then she threw them together in her mind, turning them over, seeking to see what they all meant, how what was happening all jibed with God’s centuries-old promise of a Savior-Messiah and with the angel Gabriel’s announcement that she would give birth to that Messiah. Mary collected her memories and thought about their significance. This is what I want to ask you to do over the next few minutes. The Christmas story, as recorded by Luke and Matthew, is so familiar to us that we forget not only the details, but also their meaning. We take Christmas for granted. This Christmas, I beg you to not do that. Christmas is one of the most important events in human history--and in our personal histories, surpassed only by Good Friday and Easter Sunday, neither of which could have happened had Christmas not happened. Tonight, we consider and praise God for the moment when God the Son took on human flesh and took up residence in this world, not as a king or a president, not as a celebrity or a tycoon or a general, but as a baby born in a barn to an impoverished and unmarried couple who hadn’t yet consummated their union. If you want a picture of just how much God loves you, Jesus in the manger will do. It says even more than what we might think at first, in fact. Take a look at verse 7 of our gospel lesson, please. The stage had been set by God. God had revealed through the prophets more than seven centuries earlier that the Messiah, the Son of God, God-enfleshed, would be raised in a home of descendants of King David, and that He would be born in Bethlehem, David’s city. God had orchestrated events so that Mary and Joseph would be in Bethlehem when the baby was born. God had even put it into the head of the Roman emperor to order a census in Judea so that Joseph and Mary would have to be in Bethlehem, their ancestral home, to be counted. What must Mary have thought when she placed her newborn in that manger? For sure, one thing that she must have thought about was the depths of God’s love, the lengths He was willing to go to in order to rescue you and me from sin and death. “For God so loved the world that He gave His only Son,” Jesus would tell Nicodemus decades later. And this Son would die and rise to set all who trust in Him free of the shackles of sin and death, to set you and me free to be the people God made us to be when He lovingly formed us in our mothers’ wombs. All of this had to be have been part of Mary’s pondering. 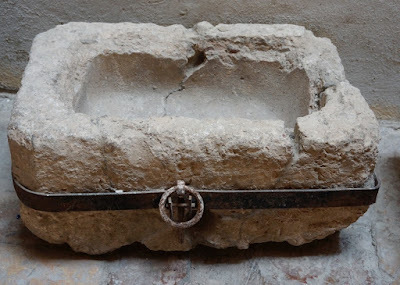 But she must also have considered the significance of the fact that her son’s first crib was an animal feeding trough. In the Greek in which Luke wrote his gospel, there were two words that could be translated as manger, table, or crib. One of those words was παχνί. 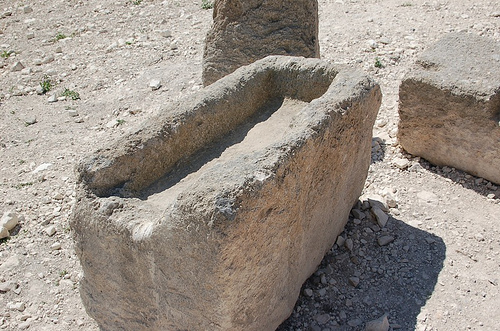 The other was φάτνῃ (phantne). When the second word, phantne, is used, it seems to usually refer to a certain kind of manger. Let me show you a few pictures ancient phantnes. 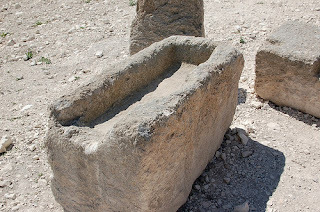 As you can see, these mangers were hewn stone, not comfortable surfaces to sleep on. 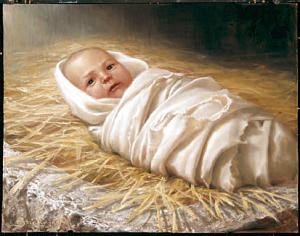 With hay in the manger and the baby wrapped in swaddling cloths, it may have been a bit more comfortable. Still, Mary would have known that this Child did not come into this world to be comfortable. He came to bring comfort, the comfort of God to a human race fallen into sin and its consequences, death. This baby came to pay for our sins, yours and mine, with His shed blood and His earthly life, on the cross. And maybe Mary thought of something else as she saw her first-born in that hard manger, of something else hewn from stone. It may have been dawning on her that the only way Israel and the rest of the human race could be saved from sin and death was for an innocent human being, also God, to bear our punishment for sin, to die, so that when God raised Him from the dead, He could raise all who repent and believe in Jesus, would have everlasting life with God. Jesus had come to die and rise in order to be our advocate in the halls of heaven. As God’s Word says: “...this is the testimony, that God gave us eternal life, and this life is in His Son. Whoever has the Son has life; whoever does not have the Son does not have life” (1 John 5:11-12). As I told the Church Council this past week, there is a whiff of Good Friday in that stone manger, a foreshadowing of the tomb where Jesus’ lifeless body would be lain. 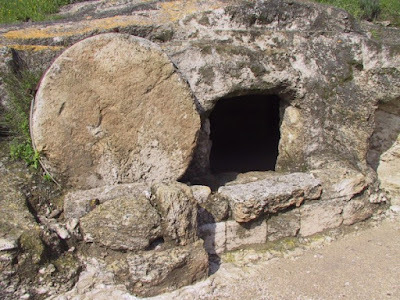 But, listen: There’s also the scent of Easter because the tomb of stone couldn’t contain Jesus and His grace for sinners any more than the news of His birth, His death, and His resurrection could have been contained these past two-thousand years. Thank God that sin and death met their Conqueror that night in Bethlehem! The Child has come to rescue you from sin, death, and purposeless living. He’s come to cover your sins in His amazing grace and make you new. He’s come to stand with you, by you, and for you as you trust in Him and call on His name. He’s come to make sense of your living and give you life beyond your dying. Jesus came into our world, precisely and specifically, because He loved not just the human race as a whole, but because He loved and loves you in particular. His birth, death, and resurrection all happened for you. And one day, He will raise all who trusted in Him from the dead. I pray that includes you and everyone whose lives we touch with the good news of Christmas, Good Friday, and Easter. This is the Christmas truth that I hope you will ponder and savor tonight and tomorrow as you celebrate the miracle of this night: This Child, the Savior of humanity, has come for you.